I can’t even tell you how much i enjoyed these. Before i get into my new obsession, let’s review the company. 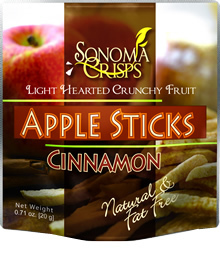 Sonoma makes their products without added oil or sugar, and they have some secret process that bakes the fruit slowly, allowing them to be super crispy without additives or frying. The only things they add are fructose and calcium ascorbate to the products, which are all natural. They come in 5 different flavors, Apple Sticks Original, Gala Apple with Strawberry Blend, Apple Sticks Cinnamon, Golden Delicious, and Raisin Crunch. Sonoma sent me the Gala Apple with Strawberry Blend, Raisin Crunch, and Apple Sticks Cinnamon variety to try. Let me say, I AM IN LOVE. Before you go, ew, freeze dried apple, take that thought out of your mind. I was in a snacking mood and i was originally thinking, okay those apple sticks are so not going to satisfy my snacking craving. I was SO wrong! 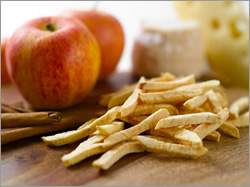 Each of the apple sticks look like tiny french fries, the shoe string kind, but they are crispy and crunchy. The Apple Stick Cinnamon flavor tasted like the Gala Apple variety, but had an extra hint of cinnamon flavor. Each of the apple varieties were sweet and just perfect. They aren’t flimsy like some freeze dried fruit can be, and they aren’t soft or like traditional dried fruit is. They are apple “cheese doodles”, if you will. 🙂 The Gala Apple was a special strawberry blend, so it also included freeze-dried crunchy strawberries. I liked them, which i wasn’t expecting. normally i don’t like freeze dried strawberries because they are too tart, but these weren’t, and were actually sweet. The Raisin Crunch was a bit different. They were plump raisins that had a hollow center and a nice crunch. They definietly had a nice “raisin-y” flavor, and i think they would be good in a trail mix or cereal rather than by themself. I hope they come out with new flavors. I think PEAR, PINEAPPLE, or PEACH would be AWESOME! Apple Sticks Cinnamon- 1 serving (60 pieces) is 70 calories, 0 grams of fat, 18 carbohydrates, 2 grams of fiber, and 0 grams of protein. Gala Apple with Strawberry Blend- 1 serving (60 pieces) is 80 calories, 0 grams of fat, 20 carbohydrates, 3 grams of fiber, and 1 gram of protein. Raisin Crunch- 1 serving (38 pieces) is 60 calories, 0 grams of fat, 13 carbohydrates, less than 1 gram of fiber, and 1 gram of protein.